Previously on 12 Monkeys . 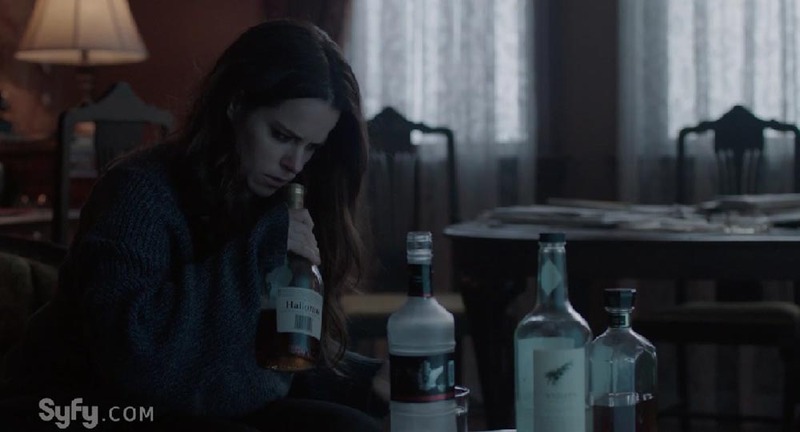 . .
Jennifer Goines, who is a Temporal Primary and thus suffers from Temporal Schizophrenia, created (or will create) in 2043 (now 2044) a Merry Sisterhood of Women known as “The Daughters.” It turns out that the name of the all-female group may be more than metaphorical as we learned in the previous episode that one of the so-called “Daughters” is the daughter of Dr. Katarina Jones, the woman who invented time travel. Katarina’s daughter, Hannah, was thought to have died when she was 10 years old during the global pandemic, but she was actually saved by the time-travelling virologist for the Centers for Disease Control, Dr. Cassandra Railly. However, believing her daughter to have died due to the viral pandemic, Katarina Jones completed the work of her estranged husband, Dr. Eliot Jones, who abandoned his pregnant wife after only six days of marriage. In telling Hannah about her father, Katarina said that he only gave her two things in life—the time machine (splinter machine) and her (Hannah), and she only thing she loved about him was for the latter (Hannah). When I first sat down to write this review of an episode I had just watched two days earlier, I realized I could not recall anything about it—which is never a good sign. For while I am constantly forgetting people’s names—including the names of immediate members of my own family and the names of women I dated while I was dating them—I usually have an excellent memory for abstract concepts and the works of art and literature I study. 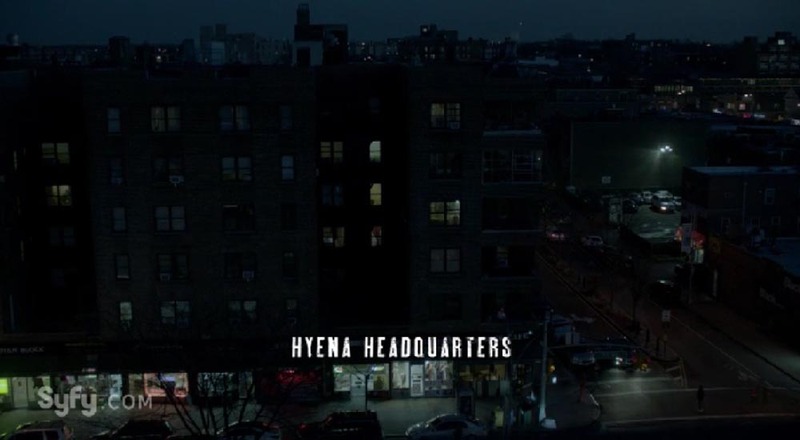 Thus, I took my inability to recall the plot of “Hyena” as a sign that it was an insignificant episode that had very little in the way of interesting intellectual content—so I reviewed the screen caps I made to see if I could recall some elements of the story. As with every episode of 12 Monkeys, the imagery in this episode was excellent, and I made several screen caps of camera shots that I greatly admire in terms of their visual composition. However, while these images DID prompt my memory a bit, the details of the overall plot did not stay with me. Essentially, Jennifer returned to the J.D. Peoples Psychiatric Treatment Center where she has previously been institutionalized. She then helped several female patients/inmates escape—leaving in their wake the bloody corpses of several doctors who worked for the sinister society known as The 12 Monkeys. While Jennifer’s collection of female psychiatric patients with criminal records is an obvious prototype for her later Merry Band known as “The Daughters,” it was clear early on that this group was not that eventual group. This 2016 version of Jennifer was not yet focused on raising someone’s daughter. Instead, she is focused on preying on the 12 Monkeys, which is why she named this gang of women “The Hyenas”—because the hyena is the natural predator of monkeys (at least that is what Jennifer insists on telling everyone). In reality, while hyenas have been known to hunt in packs like canines, they are primarily scavengers who drive off larger predators—such as lions—from their kills so that they can steal the food other animals have already hunted (but let’s not tell Jennifer she and her pack of hyenas are just a bunch of scavengers). It turns out that Jennifer’s hyenas really are a pack of scavengers more than they are hunters; for while they intended to hunt and kill the Pallid Man (sometimes known as the Tall Man, and portrayed exceptionally well by Tom Noonan), it was actually Cole who travelled back from 2044 and took charge of the hunt. 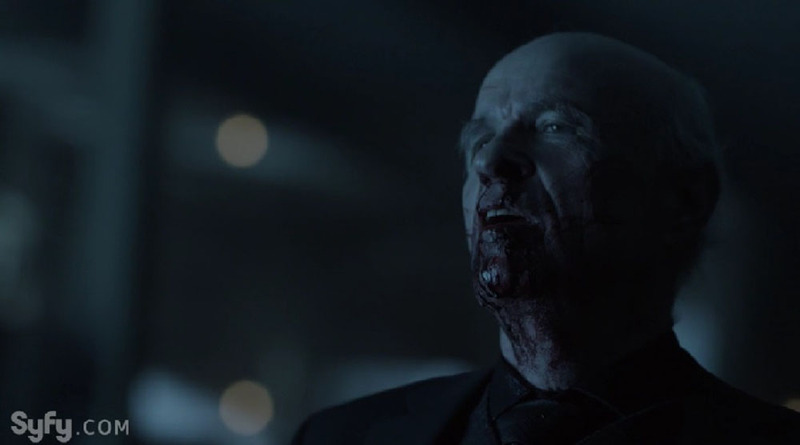 It was also Cole who beat the Pallid Man’s face into a bloody pulp—which tends to be the favored interrogation technique of every character on 12 Monkeys. Need some information? Beat or torture the person until he or she reveals the information you need! Surprisingly, it seems to always work! After Cole bloodies his face, The Pallid Man tells Cole all about the Primary in 1957 whose “Death by Paradox” will bring about the destruction of Time itself! Then there’s some business about the hyenas planting bombs to kill the Pallid Man and his flunkies, or the Pallid Man planting bombs to kill Jennifer and her hyenas—or . . . something about bombs and a building that needed to be evacuated. I’m fuzzy on the details of this part because it really didn’t have much to do with the overall arch of this season’s story. It seemed to be just a way of getting some pyrotechnics and artificial suspense injected into the episode. 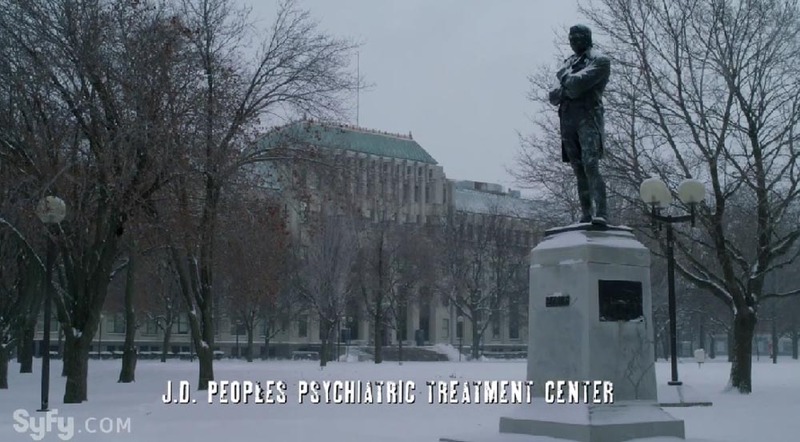 This idea of preventing the Primary of 1957 from being assassinated by Paradox is Cole’s ultimate mission, and he intends to pursue it in the next episode. In the meantime, I feel the need to point out that the show is consistently using the term paradox incorrectly. However, this episode did contain an actual paradox. The Jennifer of 2044 told Cole something a “wise man” once told her—something that Cole did not seem to have previously heard before. Cole then travels back to 2016 and tells the Jennifer of that era the “wise saying” that he learned from the Jennifer of 2044—which makes the message a circular communication that has no origin or end point. It’s like a sentence turned into a verbal Möbius strip. It’s enough to drive a person to take up drinking! However, it’s not enough to cause a temporal explosion that will destroy the Fourth Dimension and cause storms of red lightning to traumatized the people of 2044. 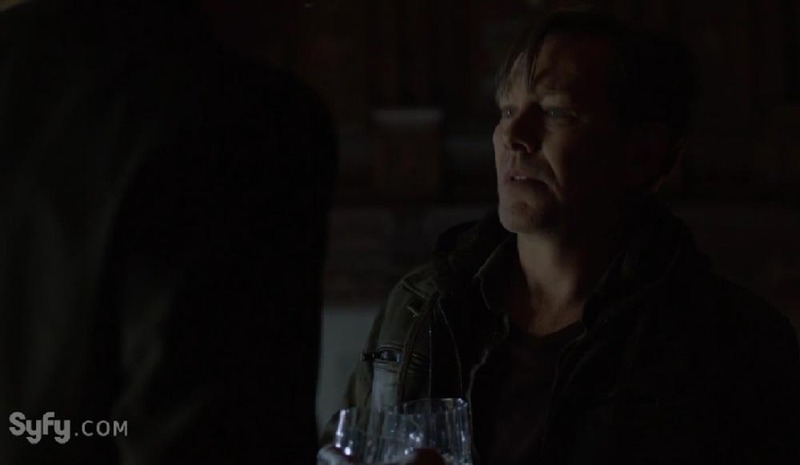 In the end, the only interesting thing about the episode—aside from the amazing camera shots—is that Katarina’s estranged husband (ex-husband?) Eliot Jones turns up as the Pallid Man attempts to persuade him to build another Splinter Machine like the one he built and abandoned when he abandoned his pregnant wife 35 years earlier.